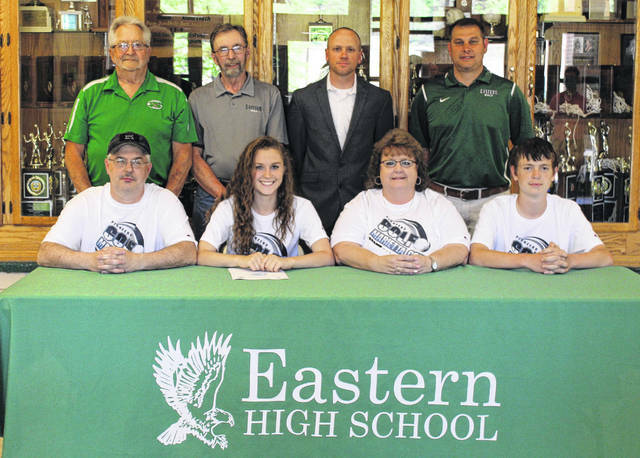 On May 11 at Eastern High School, senior Kaitlyn Hawk signed her National Letter of Intent to join to the the Marietta College golf team. Sitting in the front row, from left, are Jeff Hawk, Kaitlyn Hawk, Robyn Hawk and Brad Hawk. Standing in the back row are Wally Hatfield, Ken Tolliver, Nick Dettwiller and Jeremy Hill. TUPPERS PLAINS, Ohio — After a busy and successful high school career, it’s time to give it a go at the next level. On May 11 in the Eastern High School, senior Kaitlyn Hawk signed her National Letter of Intent to join the Marietta College golf team. “I didn’t pick up a golf club until my freshman year, and I have just fell in love with it since,” Hawk said. “To be able to play four more years is an honor. Everyone who has supported me, family, friends and coaches, I know I wouldn’t be here today if it wasn’t for them. For the first two years of her high school golf career, Hawk played under head coach Nick Dettwiller, who remarked on Kaitlyn’s work ethic and her ability to lead, even at a young age. As a junior and senior, Hawk’s golf coach was Jeremy Hill, who noted that with golf as Kaitlyn’s primary focus, the sky is the limit. Hawk was named to the Division II All-District squad as an honorable mention in her senior season. When asked about her favorite memory of high school golf, Hawk reflected back to her sophomore season, when she and the Lady Eagles made history at the Division II sectional tournament at Hocking Hills. The Lady Eagles were a single stroke from returning to districts in each of the last two years, something Hawk is using for motivation. In the sectional meet at Chillicothe Jaycees in her senior season, Hawk fired her career-best round of 97, the team’s best score of the day. Hawk’s best score for nine holes is a 45 fired at Meigs County Golf Course, while her favorite course to play is Riverside Golf Club. Hawk will be joining a Pioneers team that competes in the Ohio Athletic Conference and NCAA Division III. Marietta College is coached by Tom Arison, who led the Pioneers to a sixth place finish in the OAC championships last season. Hawk plans on a Health Science major in her first four years at Marietta College, and then plans to apply for the Physician Assistant master’s degree program at MC. With a grade point average of 4.212, Hawk is the Salutatorian of the EHS class of 2018. 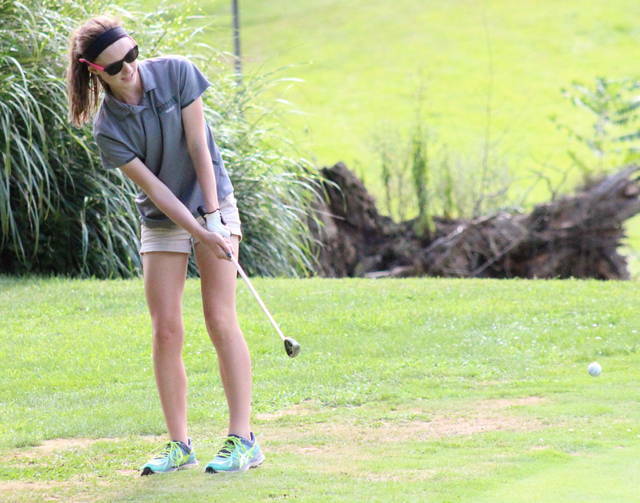 In addition to her success on the course and in the classroom, Hawk — a member of the National Honor Society — has excelled in three other sports at EHS, earning a total of 14 varsity letters. Kaitlyn was a freshman on the first-ever EHS girls cross country team to reach state. As a four-year member of the cross country team, Hawk helped the Lady Eagles capture four Tri-Valley Conference Hocking Division titles, as well as four district titles. As a distance runner for on the Lady Eagles’ track and field team, Hawk has helped win four league titles and has competed at the regional level. Hawk was a two-year member of Eastern’s varsity basketball team, helping the team to a district title in 2017.